This week’s excellent Washington Post reports by reporters Halsey and Laris outlined US railroad lobbyists’ ability to secure a three-year delay in implementing the key railroad safety equipment demanded on the original 2015 deadline by Congress in the Rail Safety Act of 2008. There is a parallel and highly related story, so far unwritten, on how the railroads and allied interests relentlessly gain even more decisive and long-lasting ways to advantage profits over safety. Even when Congress roused itself to demand more safety as in the 2008 RSIA, the seemingly permanent Reaganite legacy of “starving the beast” of government regulatory agencies grinds on to render the regulations pitifully weak. Now the timid and under-staffed Federal Railroad Administration is quietly piddling away the once-in-a-generation opportunity from the 2008 law to impose a significant modern safety improvement regime [already seen in many industries] on the mighty railroads. The public and Congressional alarm at several high-profile fatal rail disasters that led to the 2008 Rail Safety Improvement Act prompted Congress to include a strong mandate on the Federal Railroad Administration to impose a 20th Century type of Risk Reduction Program regime on the railroads. This surprising loss by railroad lobbyists in Congress – although they secured some weakening amendments – led to strenuous railroad efforts to prevent the FRA from crafting any strong regulations. The out-gunned FRA effectively suffered a regulatory failure of nerve, and buried the rulemaking process out of sight for four years, gaining only a weak-tea and partial consensus from railroads and rail labor in FRA’s own ad hoc Working Group of industry insiders. A couple of ill-attended public hearings drew no public attention. The resulting proposed rule in 2015 had two major safety-weakening features: first, it gave the railroads a new secrecy pot to hide railroads’ own safety risk information from discovery in court proceedings on railroad negligence. Trial lawyers, citizens and some officials alarmed about the appalling secrecy already granted to railroads, for example in their decisions to route ultra-hazardous crude oil trains through major cities, filed comments opposing this new secrecy grant. More importantly, FRA proposed to impose on the railroads only “a streamlined version” of a modern Risk Reduction Program regime. The comprehensive and robust one mandated by Congress would have required significant new efforts by FRA to approve and oversee railroads’ Risk Reduction Programs, and to ensure compliance. FRA staffers no doubt felt they were not up to that task, so punted the responsibilities — to each covered railroad to create its own safety regimes and to decide how to measure their own effectiveness, with no federal guidance. Undermining the most significant Congressional rail safety mandates we may ever see is hardly the new beginning we need. WASHINGTON — President Obama’s nominee to lead the Federal Railroad Administration faced tough questioning by lawmakers on Thursday about the rail industry’s contention that it cannot meet a year-end deadline to install a safety technology meant to keep trains from derailing. Sarah Feinberg, 37, who was nominated by Mr. Obama in May, has been acting administrator of the agency for about nine months. During that time, there have been several train crashes attributed to excessive speeds, including in May, when an Amtrak passenger train derailed in Philadelphia, killing eight people and injuring 200. Under questioning by a Senate panel weighing her confirmation, Ms. Feinberg said the railroad administration would enforce the 2008 law that set Dec. 31 of this year as the deadline to have railroads install the technology, known as positive train control. “On Jan. 1, we will enforce the deadline and the law,” Ms. Feinberg said. She said the agency would work with the rail companies to help them with technical and financial challenges they face in trying to install the safety technology. But she emphasized, “We do not have the authority to extend the deadline.” That authority belongs to Congress. The deadline to install positive train control, which dominated the questions at the hearing, has become a contentious issue. Some members of Congress have proposed pushing back the deadline. A Senate bill passed in July would extend it to 2018. But many safety advocates say the industry has known of the deadline for years and should be able to install the technology on time. A report on Wednesday by the Government Accountability Office, the investigative arm of Congress, found that no railroad would be able to fully install the technology by the end of the year. The investigators recommended that Congress extend the deadline. Many railroad operators say they will refuse to carry crude oil or hazardous chemicals after Jan. 1 if Congress does not do so. At the hearing, Ms. Feinberg received tough questioning from Democrats and Republicans, who asked if the agency had contingency plans if the railroad industry did not meet the deadline. “If you know that they aren’t going to be in compliance at the end of the year, what are you going to do?” asked Senator Claire McCaskill, Democrat of Missouri. Ms. Feinberg, a former Facebook executive and White House adviser, has dealt with several high-profile rail accidents during her tenure at the railroad administration. In addition to the Amtrak wreck, a train derailment in Oxnard, Calif., killed the engineer and injured about 30 people, and an oil train derailment in West Virginia caused the evacuation of about 100 people from their homes. During her tenure, higher domestic oil production has caused a significant increase in the amount of crude oil traveling by rail, setting off concerns about the safety of those shipments through cities and towns. Before she became acting administrator, Ms. Feinberg’s most relevant transportation experience was the nearly 18 months she spent as chief of staff to Anthony Foxx, the transportation secretary. Mr. Foxx, whose department oversees the railroad agency, has said that Ms. Feinberg has his full confidence. Railroad administrators without transportation experience are not unprecedented. Recent examples include Gilbert E. Carmichael, who led the agency from 1989 to 1993 and was active in Mississippi Republican politics before he became administrator. Likewise, John H. Riley, who led the Federal Railroad Administration from 1983 to 1989, worked as a Senate aide before being appointed to lead the agency by President Ronald Reagan. During her time as acting administrator, Ms. Feinberg has issued a crude-by-rail rule that imposes significant new safety requirements and has started a partnership with Google to integrate the railroad administration’s grade crossing data into its mapping software, allowing users to receive audio and visual alerts about railroad crossings. Ending months of uncertainty and delays, federal regulators on Friday unveiled new rules for transporting crude oil by trains, saying the measures would improve rail safety and reduce the risks of a catastrophic event. But the rules quickly came under criticism from many sides. Lawmakers and safety advocates said the regulations did not go far enough in protecting the public, while industry representatives said some provisions would be costly and yield few safety benefits. More than two years in the making, the rules followed a spate of derailments, explosions and oil spills around the country that highlighted the hazards of shipping large quantities of potentially explosive material on rails. The regulations introduce a new tank car standard for oil and ethanol with better protections, and mandate the use of electronically controlled brakes. Facing growing pressure from members of Congress as well as local and state officials, the Department of Transportation has taken repeated steps in the last two years to tackle the safety of oil trains and reassure the public. Last month, for example, it set lower speed limits for oil trains going through urban areas. Under the new rules, the oldest, least safe tank cars would be replaced within three years with new cars that have thicker shells, higher safety shields and better fire protection. A later generation of tank cars, built since 2011 with more safety features, will have to be retrofitted or replaced by 2020. 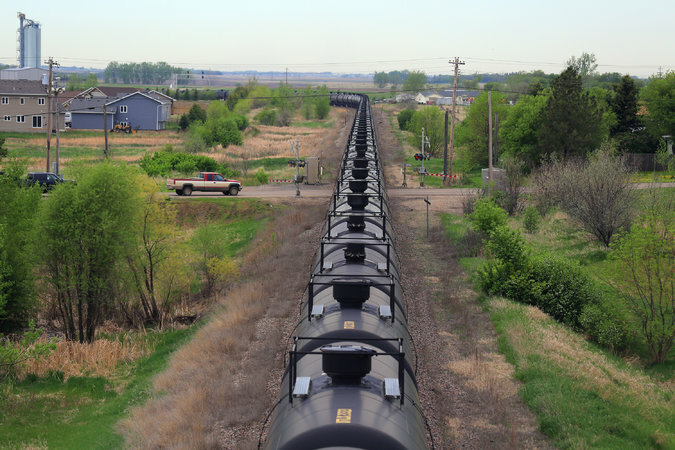 Oil trains — with as many as 120 cars — have become common sights in cities like Philadelphia, Albany and Chicago as they make the slow journey from the Bakken region of North Dakota, where oil production has surged in recent years. Local and state officials have complained that rail-friendly rules make it difficult to predict when trains will pass through. But regulators retreated from a provision that would have forced railroads to notify communities of any oil train traffic. Instead, railroads will need to have only a “point of contact” for information related to the routing of hazardous materials. Several members of Congress, particularly those representing states like Washington, Oregon, North Dakota and New York that have seen a surge in train traffic, said the rules did not go far enough and signaled that legislation might be needed. Senators Ron Wyden and Jeff Merkley of Oregon said they were disappointed that transportation officials had not expanded public information about oil train routes. “Instead of providing first responders more details about oil shipments, railroads will simply be required to give our firefighters a phone number,” they said. Railroads said they welcomed the new regulations but objected to a provision that would require tank cars to have electronically controlled pneumatic brakes by 2021. The Department of Transportation said the new brakes, known as E.C.P., are more effective than air brakes or dynamic brakes that are currently being used. The railroad association has estimated in comments filed to the Transportation Department last year that installing the new brakes would cost $9,665 per tank car. The Railway Supply Institute, which represents tank car makers, also pushed against the use of those brakes, saying their effectiveness was not proved and would not provide a significant safety advantage. Transportation officials said the new type of brakes was already in use by some railroads for other types of commodities. Their use would decrease the chances of a catastrophic pileup, reduce the number of punctured cars in an accident, or allow train operators to stop faster if there was an obstacle on the tracks. There have been five explosions and spills this year alone, four in the United States and one in Canada. In July 2013, 47 people died in Canada after a runaway train derailed and exploded in the city of Lac-Mégantic, Quebec. “I am hopeful the rail industry will accept this rule, and will follow this rule,” Anthony Foxx, the transportation secretary, said at a news conference in Washington. He appeared with Canada’s transport minister, Lisa Raitt, who said Canadian and American regulations would be aligned. A central question before the administration was to determine what level of protection the new generation of cars should have and how quickly to roll them out. By 2018, the rule would phase out older tank cars, DOT-111s, long known to be ill suited for transporting flammable material. A newer generation of cars, known as CPC-1232, would have to be retired or refitted to meet the new standard, DOT-117, by 2020. All cars built under the DOT-117 standard after Oct. 1, 2015, will have a thicker nine-sixteenths-inch tank shell, a one-half-inch shield running the full height of the front and back of a tank car, thermal protection and improved pressure-relief valves and bottom outlet valves. Senator Charles E. Schumer, Democrat of New York, said Friday’s announcement gave railroads too much time to remove older cars from service. Mr. Schumer was one of seven senators who unveiled a bill that would seek to impose a fee of $175 per shipment on older cars to speed up their removal from service. “The good news is that the standards are predictable, but the bad news is that the phaseout time is too lenient,” Mr. Schumer said. Senator Marie Cantwell, Democrat of Washington, was more forceful, saying that the new regulations also failed to reduce the volatility of Bakken crude, which is more likely to catch fire and explode than other forms of crude. Oil companies, though, said the mandate to build new tank cars to replace older models starting in 2018 would stretch the industry’s manufacturing ability and lead to shortages. Placing blame on the railroads, Jack Gerard, the chief executive of the American Petroleum Institute, said regulators should focus instead on preventing derailments and enhancing track inspection and maintenance. The spectacular growth of oil production from the Bakken region, negligible only a few years ago and now exceeding a million barrels a day, has transformed the domestic energy industry. It has placed the United States back on a path to oil self-sufficiency, and profoundly disrupted international energy markets.